There is no place for crows on the Chayne at the moment. The new call bird hasn’t been long in working his magic. The hardest part of operating a number of larsen traps is catching the first bird, and many people find that as soon as they get a good caller from somewhere else, they are suddenly overwhelmed with successes. Sure enough, less than twelve hours after installing Gustav, the call bird, he trapped a pair of aggressive and territorial birds who have managed to evade my rifle for the past two months. Fingers crossed that he will continue to go from strength to strength. 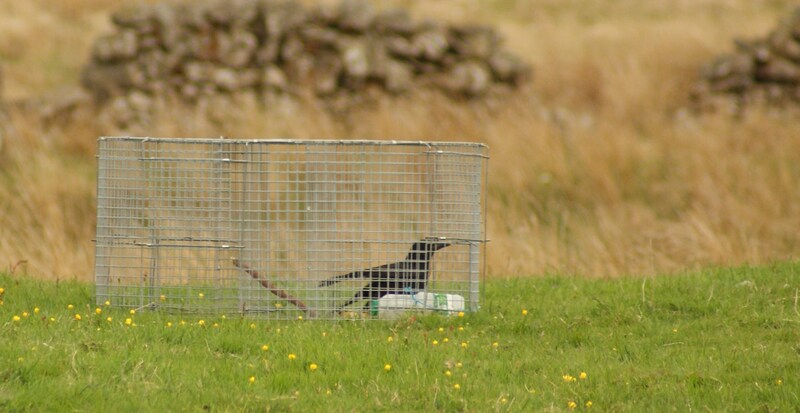 In the meantime, the captured crows have been redistributed to other traps around the farm. Cutting a drainage ditch may be tough and mucky work, but seeing the water trickle down is a deeply satisfying feeling. My oat empire is expanding. Despite the fact that chaffinches have pecked away at the majority of the oats I sowed last week, the sky is the limit for the size of area that I can plant up with cereal crops. The major downside to the Chayne is the fact that nothing at all has been done to help drainage for the past forty years. As a result, the traditional pasture fields are now smothered in rushes and sopping spongey moss. Any attempt to sow a sacrificial crop in that muddy soup would surely end in disaster, so I recently decided to see how drainage would effect the soil. Fencing off around two thirds of an acre of what was formerly a field for overwintering galloway cows, I started to dig out the rushes. Enlisting the help of a friend from university, we also dug two trenches just inside the fenceline, one cutting a diagonal across the steepest section and another running directly from top to bottom. Draining without seeing any water is truly disheartening work. We had dug more than twenty feet before the soil even began to look slightly damp. With snipe squeaking disapprovingly from the rushes nearby, midges descended and we were forced to race back to the car. When we returned to the new patch this morning, a tremendous change had taken place. The ditches had been gradually filled with water overnight, and now it trickles downhill in controlled channels. The ground all around is still sopping wet, but in a few weeks this area should start to show real signs of improvement. The water’s slow leaching action is slowed by the fact that acidic, peaty soils hold it in like a sponge. By the time the surface soil has dried out enough to till and sow with oats, it will be well into June, but since I don’t plan to harvest it at all, that’s not really a problem. 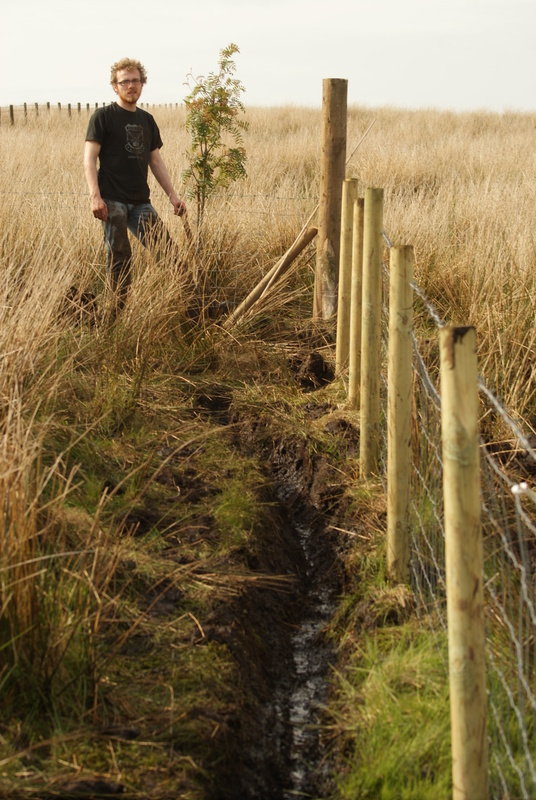 The ditches have cut off about a quarter of the patch which won’t now see any improvement from the work at all, so perhaps it should be planted with willow or alder, which won’t mind the water. "Gustav" settles into his new home above the black grouse nest site. Knowing where the black grouse are nesting gives me the opportunity to focus my management efforts on the right area. I have sown oats in an adjacent garden and am now preparing another little patch on the hillside above the farm where I have seen the blackcock strutting around over the past few weeks. Much of that area is choked with rushes, so I am having to dig out individual clumps with a shovel. It is extremely hard work, but once the ground has been cleared and drained, it should make for quite a profitable little gamecrop. Yesterday morning I had a phone call from a friend offering me the services of a crow. She has recently started using a Solway MultiLarsen trap and is having tremendous success with it. The fact that the trap has three compartments means that, at the moment, she has more crows than she knows what to do with, and rather than just wring their necks, she is handing out live call birds to other traps as fast as she can. I drove over and picked up a furious hessian sack which bounced and scuffled in the boot of my car all the way up to the Chayne. By law, call birds must be adequately fed and watered and provided with a sheltered spot so that they can get out of the worst of the weather. I set up my own MultiLarsen trap near the black grouse nest site with a sachet of dog food, a plastic milk bottle full of water and a little pine perch so that the beast in the sack who rustled behind me would be humanely catered for. With a great deal of fluttering and struggling, a fine crow came dancing out of the sack and into the trap. He took a moment to rearrange himself, then set about gobbling down the dog food. I took the quad bike off up the hill to work on the new oat patch, but remained within sight of the trap to see how things progressed. 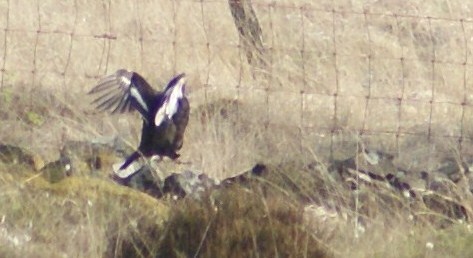 After an hour, the black grouse appeared and started poking around the trap site. I worried that he might decide to go in and investigate, but he seemed happy to sit on the dyke nearby and sun himself. An hour later he had gone, but the trap was being assailed by a pair of territorial crows. They fussed and pecked at the call bird from outside, cawing and raging all around. The call bird (who I have now named “Gustav”) seemed blissfully unconcerned, and popped up and down off his perch as if it was all fairly normal to him. It should now only be a matter of time before those crows snare themselves in the MultiLarsen, and given that they obviously operate the territory where the black grouse lives, the sooner it happens, the better. One of many suggestions to come from my recent meeting with John Cowan was the idea of putting in a so called “sacrificial crop” for the benefit of the black grouse. Despite being so much rarer than red grouse, blackcock actually seem to be rather easier to look after than their famous cousins. Historically, they happily entered arable stubbles in the autumn and winter to feed on fallen seeds, and once used to taking food from these artificial feeding stations, they can be fed quite reliably throughout the winter months. 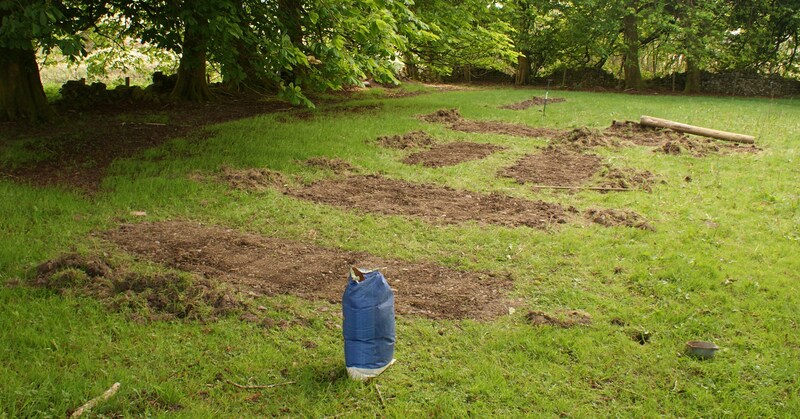 Until my silver birches grow large enough to supply natural food, it is an excellent idea to install a few patches of arable crop across the farm to keep the birds interested. Oats are the traditional crop of the Scottish lowlands, and so it was with some trepidation that I ordered a sack of seed last week. I know nothing at all about planting and growing cereals, but I asked around and I hope I have now got the gist of it. Sacrificial crops are sown purely for conservation reasons and will never be harvested. As the oats grow up and die, they should flop over and leave a nice system of straw and black grouse food on the farm. Considering that a 25kg sack of oat seed cost me eight pounds, I must say that I don’t really mind not seeing a financial return on that investment. Not having access to any agricultural machinery, everything has had to be done by hand. It is not hard to break the turf with a fork and leave it to dry, but it takes hours to sift out the grass and rip up the clumps by hand. It has taken two days to clear and sow half a dozen little patches of oats at the foot of the shepherd’s garden near where the black grouse was lekking this year, and I now can’t wait to see how they will turn out. Using a massive straining post to roll the patches not only compressed the soil but made them look satisfyingly neat and tidy. I now plan to clear and drain a small patch of rushy bog on the hillside above the farm. Even if the worst comes to the worst and the black grouse are killed off by foxes in the next few weeks, it could be that having a nicely positioned little cover crop on the hillside will attract wild pheasants in the winter. As well as benefitting black grouse, cereal stubbles provide food for a number of different bird species in the cold weather, and birds like yellowhammers, skylarks, tree sparrows, linnets and buntings will get as much benefit as anyone. Accompanied by his faithful labrador Bliss, Richard tests some home loaded rounds for his ruger 25-06 at six hundred yards. As was driven home quite firmly once again last week, rifle shots on the Chayne are always long. 1600 acres of open, undulating moorland mean that stalking skills are almost totally redundant. You either take a long shot or you don’t fire at all. My confidence with rifle accuracy is steadily building, but only because of the support I’m getting from my friend Richard Waller. Richard has been helping me with various bits and pieces as my project on the moor progresses, but his real speciality is vermin control. Richard is a rifle enthusiast with a real interest in high performance bullets. He recently established a new business in nearby Dalbeattie selling custom loaded ammunition for local stalkers and foxers, and I have found his bullets absolutely second to none. Watching him shoot crows and foxes well over three hundred yards away with his own hand loads was mind blowing, and as soon as he had compared how much tighter his groupings were with those from factory rounds, I became a complete convert. When my .243 fires factory rounds, I can put three bullets in a 3 inch group at a hundred yards. With Richard’s bullets, I can put them into a space the size of a five pence piece. There are so many different variables in the world of ballistics, and just a little tweak here and there can make an enormous difference to accuracy. Each rifle is subtly different, and as soon as Richard worked out the basic specifications for my .243, he was able to churn out fantastic quality bullets for a fraction of the price of factory rounds. He jumped onto the dyke, then jumped off it, then jumped back onto it again. After a little while, he jumped off and then jumped back on again. He seemed to find it extremely entertaining. The black grouse and his greyhen seem to be doing very well in the bog by the farm buildings. I watched him this afternoon as he jumped back and forth off the foundations of a ruined stone wall a hundred yards away. In theory, the greyhen should be sitting on eggs by now and he must just be kicking his heels until the chicks appear. Not that he’ll have a hand in raising them anyway, but judging by his personality, he’ll try and claim all the credit. It’s almost impossible to relate how excited I am by the potential of chicks, but they will inevitably vanish into the beaks of crows and kites within a few hours. I am trying not to get my hopes up. I recently got in touch with John Cowan, author of the controversial new book “Advice From a Gamekeeper”, in the hope that he could shed some light on helping grouse and black game. John has a great deal of experience with black grouse, and with a working experience on land around the Ettrick valley and Eskdalemuir during the 1980s, he must be one of a handful of people in the region who can really speak with authority on the subject. He was thrilled to hear that black grouse are still alive and well (although in seriously depleted numbers) in the Galloway hills, and he told me some very interesting things about management and keepering. It may be necessary to put in a “sacrificial crop” of oats for the black grouse and his greyhen over the next couple of weeks, not only to keep the family fed up into the autumn, but also to stop the chicks from vanishing if they survive through the winter. Patches of sown oats are the traditional favourites of black grouse, and it could be that I can buy their loyalty to the Chayne by giving them a decent and reliable source of their favourite food. As far as trees go, John was very helpful in offering advice. He recommended that I should plough an area for planting it so that the nutrients locked in the wet peat can be turned over and allowed to come into play. He remembers an enormous population explosion of black grouse in the Borders within a few years of a sheep farm being ploughed and planted. Blaeberry and heather went into overdrive, and even though new pine plantings quickly lose their nutritional value, there is no reason why thoughtful thinning after five or six years couldn’t prolong the productivity of the habitat. It is always helpful to get a new perspective on the project, but when advice comes from such a knowledgeable and encouraging source, it gives everything a new energy. I am becoming wary of caterpillars. Ever since I discovered that certain species occassionally undergo population explosions and destroy heather stands, I have treated every new species with suspicion. 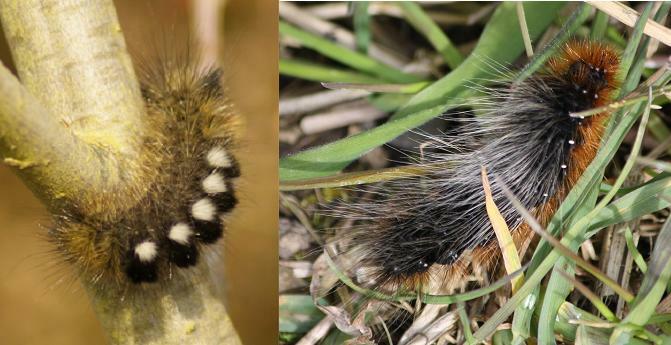 It turns out that the most pestilent species of caterpillar for upand keepers is actually faily small and dull looking, but uncovering fantastically decorated species as I have over the past few weeks, I can’t help my initial reaction being one of horror and fury. Around ten days ago, I was taking cuttings from a willow tree behind the farm when I came across the caterpillar of the dark tussock moth. He was partially coiled around a twig on one of the higher branches, and as soon as I returned home, I looked him up online. Although dark tussock moths do feed on heather, they are quite rare and it would be fairly unlikely that they would cause me any trouble. This morning I found an unbelievably hairy caterpillar coiling himself around a new stalk of bracken in the triangle wood. Orange underneath with a silvery black mat of silky hairs flowing from his back, he looked like some kind of alien. Now I know that he was (or will become) a garden tiger moth. The moths are really stunning, and according to http://ukmoths.org.uk, they’ll fly in July and August. I know that there are only a couple of moth species that I should really be looking out for as being potentially destructive, but there is such a fascinating variety out there that I can’t help being interested by the innocent bystanders.